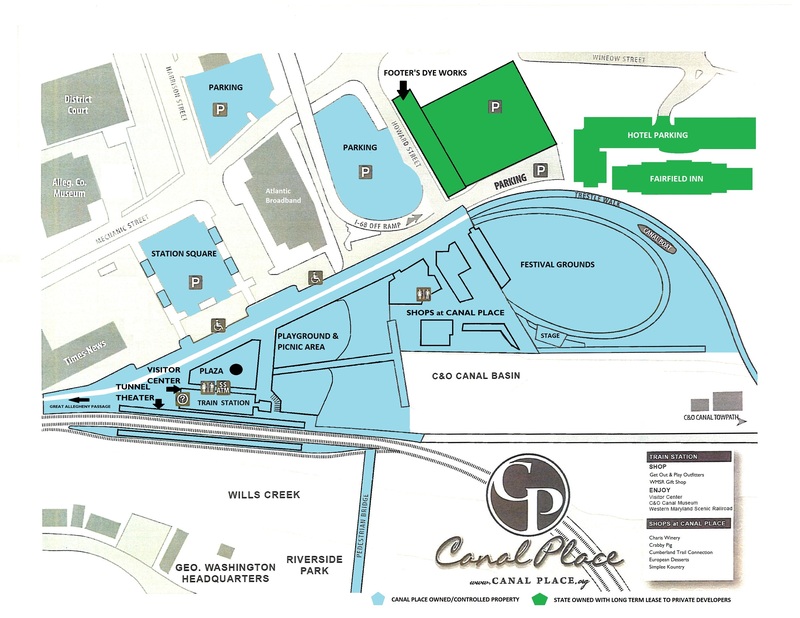 Canal Place Heritage Park is located just off I68 at Exit 43 C in the heart of Downtown Cumberland. Attractions located here are: Mile Marker 0 of the Great Allegheny Passsage, the Terminus of the C&O Canal Towpath, the C&O Canal Museum, Boarding for the Western Maryland Scenic Railroad in the Western Maryland Railway Station, public restrooms, the Shops at Canal Place, the Canal Place Festival Grounds, the Fairfield Inn and Suites, parking, modular playground, and Allegany County Visitors Center. Under construction now is the Historic Footers Dye Works building. This multi-use building will afford luxury apartments and available retail space.